Now that you have created your Overview Page application, you can decide on the type of cards based on your scenario. A typical use case could be a list of items that needs immediate attention are displayed along with the criticality indicators. In this blog post, we will explore the features that list card has to offer. 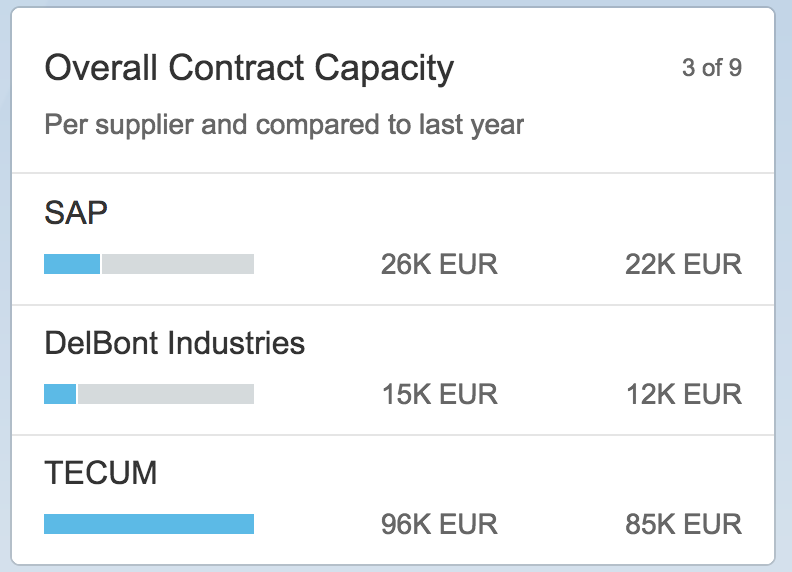 The “Condensed” list card shows minimal information – two lines of text and a number, and inherits the properties of the Standard List Item UI5 control -sap.m.StandartListItem as shown in Fig 3. 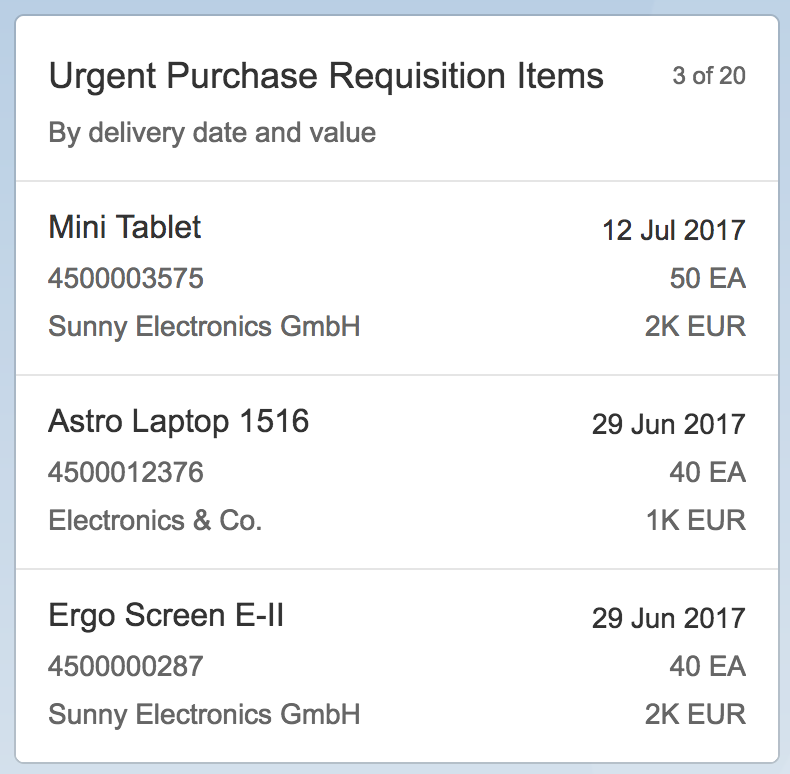 The “Extended” list card displays more information – three lines of text and three numbers, and inherits the properties of the Object List Item UI5 control -sap.m.ObjectListItem. The Bar Chart List Card adds a chart component to a list. 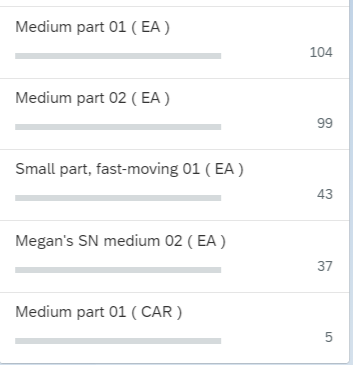 A Progress Bar [new chart] can be embedded in either a Condensed Fig 4.1 or Extended List format Fig 4.2. Note that the count of records in List card was shown in a separate footer row, starting SAPUI5 1.48 onwards this is available in the header section. The KPI shown in the header area will be discussed in detail in another blog post. One thing I’m missing in all articles on Overview Page and the use of Cards, is what the requirements are for the Gateway service that you are using for a card. I suppose this is also different for each card type. PS: this is not exhaustive, and the detailed documentation for gateway must be referred to. Former Member Thanks for compiling this list. How to pass dynamic parameters to input parameters of odata source ? I understand that we can pass hard coded values ui.selectionVariant but how to pass dynamic values ? For example current date, Need to pass current date as input parameter to xsodata. I am glad you find the blog useful. defaultSpan is not a released Feature yet. I shall update you once this is available. Is this functionality implemented yet? Do you know when this will be? Does anyone know how to represent the progress (completion of the progress bar) in the progress bar? I can’t detect which part of the annotation does this, in my case the progress bar is always full even if the percentage is lower than 100%. Thanks in advance. Is the data returned in this case in %? I guess that could be an issue. If the value is not in percentage Max and Min is selected from among the present set of values, else in case of percentage Value Min is 0 and Max is 100. Yes, you are right, that was the reason. As soon as I added more entries the progress is properly reflected in the bars. Thanks! In any case, how do you specify a percentage data? I don’t find the way in the metadata or annotation. I was using Decimal data type for this percentage values. Yes, I was able to work this out. See details from my annotations. Can you tell me whats it that I am doing wrong here? The only difference I can see is with the ValueFormat….give it a try. I tried that but it doesnt seem to work either. Whats the edm type you have used for percentage? Prasita Can you please help? 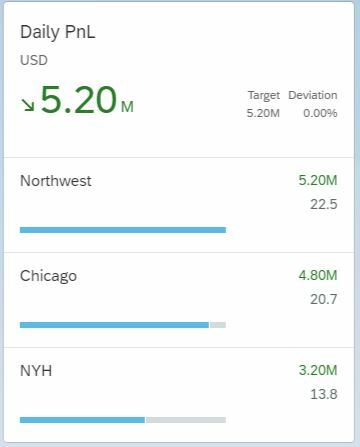 Target value will be read from data point annotation. deviation value will be calculated from KPI value and target value as below. its not possible to change target an deviation text. It is great to have this Target and the Deviation as standard. But in many cases in which I came across with users, I would like to see the following features. Should be able to change the Labels(Target, Deviation) to whatever users want. Thanks and Keep upi the good work. Really looking forward for the same kind of features too, in my case I even need to hide Deviation figure and just keep the Target. I’m trying to do it using custom code at onAfterRendering event using a custom controller but it is working weirdly when applying filters. I really expected that these kind of features (change labels, hide information,…) must be achievable by annotation modeler. Found nothing in the standard documentation. Thank you for your feedback, is there a specific scenario for which you would need this? This will help us in evaluating the requirement. Not really an specific business scenario, they are only customer requirements to modify certain labels or hide UI elements. Thank you for your feedback, I have emailed you for creating a feature request, so that this can be evaluated for further releases. You can find the details for Target and Deviation explained here, within the section for DataPoint annotation. The labels Target, and Deviation cannot be changed. Thank you for all replies.. Helps a lot!! One thing I noticed in list and table cards. These cards show only top few records. for example I have list of 10 records but card shows only top 3. what needs to be done so that we can scroll thru all records in the card on a desktop and hand held devices, say Ipad ? Ideally a navigation to the corresponding app with the detailed information would be the recommendation. OVP serves the purpose of a step between the basic information displayed using SAP Fiori launchpad and the details shown in corresponding SAP Fiori applications. However with newer versions of SAPUI5 you will have an option to resize the card to suit your requirements. This too will limit the display to the number of lines that fit into the size selected. Scroll will not be an option in this as well. One query regarding OVP. 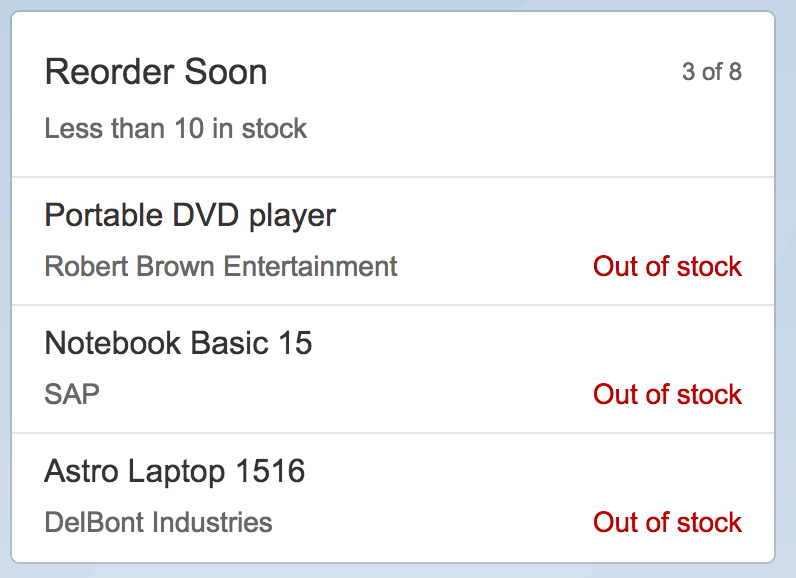 I have a parameterized cds view for my list card C_MntrPurchaseOrderOvwPage, with currency field as parameter. I do not need any aggregation to be added to any of the fields in my cds. As a result it appears as C_MntrPurchaseOrderOvwPageSet(without aggreagation) and not as C_MntrPurchaseOrderOvwPagesResults(with aggregation) in the service. However in the get call, the call goes for C_MntrPurchaseOrderOvwPageSet without parameters passed in case of no aggregation. Is it mandatory to have aggregation in parametrized view? Entity set and type and are maintained properly in Manifest and Annotation file. Also parameters are passed in annotation file for selection variant. Currently I am adding aggregation in the cds. Hence parameter is getting passed. Kindly Let me know if I need to make any changes. As per the core Analytics support on parameters, it is mandatory to have aggregations for parameters to work. Anyways I either get it to show text/description and count OR the image. As soon as I add the IconUrl DataField the icon appears but everything else disappears. How do I get this right? 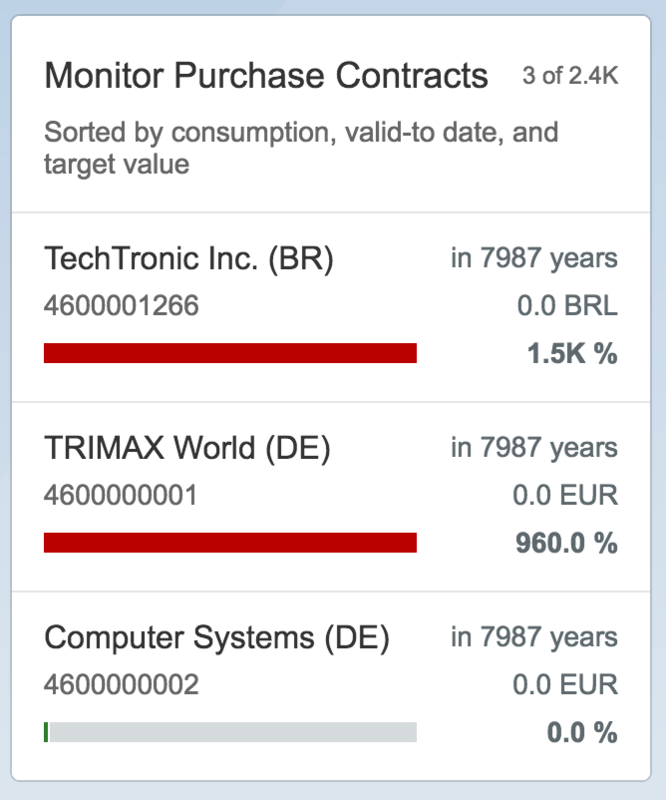 Can you please help on where to add $top – To get top ‘x’ records to show in cards. I am using data from IOT-MMS to display on cards , and need to display only last 5mins data. Also , Please let me know if how I can add custom filter to display last 5min data only on Cards . We don’t support usage of $top by means of annotations in OVP. You can perhaps considering a descending sort on the creationTime to achieve this. Great blog ! Can you kindly suggest which one is the best practice for writing annotations – Through web ide annotation modeller or through cds view? Thank you for your comments. First preference will be for cds, and if not supported then via the annotation modeller. I have followed the blog in my code to use Bar Chart List Card, however the datapoint is not shown in the default “Blue” color. I am curious if this is related to the number-format in the backed, as it is “Edm.Decimal” currently. Check for infoState as described in Fig 3.